On behalf of PHASE 4 Learning Center, Inc., I would like to thank you for all you have done to help us have a successful first year at our Washington location. Your math and technology expertise, as well as your photography abilities are tremendous and deeply appreciated. Bart, also, thank you for attending each of our special functions and photogrphing important guests and events. Your photos will help instill memories for a lifetime for both students and adults. 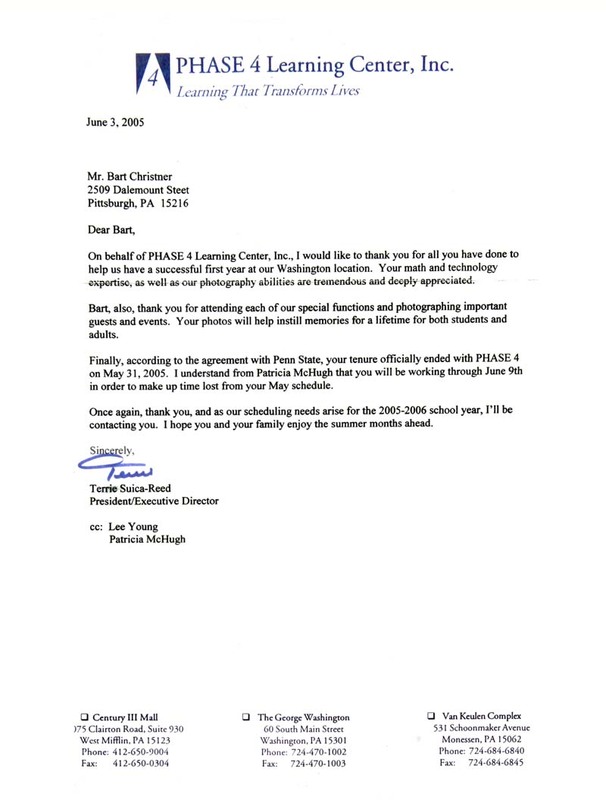 Finally, according to the agreement with Penn State, your tenure officially ended with PHASE 4 Learning Center on May 31, 2005. I understand from Patricia McHugh that you will be working through June 9th in order to make up time lost from your May schedule. Once again, thank you, and as our scheduling needs arise for the 2005-2006 school year, I'll be contacting you. I hope you and your family enjoy the summer months ahead.